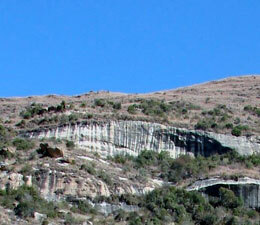 Have you ever wondered what causes the dark vertical stripes on the cliffs around Clarens and elsewhere? These are the result of humic acids leaching down from the overlying vegetation, combining with lichens and even bagworms. Although not strictly speaking plants, I include them in this series as they are such fascinating organisms. 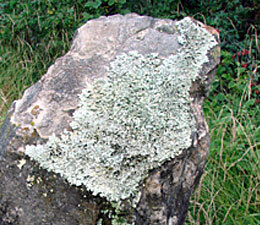 A lichen is made up of two different organisms, growing in the same body and dependent on each other. The larger and visible part is a fungus, within which are hidden blue-green algal cells. The fungi serve as the attachment to a surface as well as the recipient for moisture, whereas the algae, being green, manufacture the necessary food for the body by means of photosynthesis. Lichens are believed to cover 6% of the earth’s surface and are found on a variety of surfaces, notably tree bark, cliff faces, boulders and soil. Fruticose (“Old Man’s Beard” of forests), Foliose and Crustose, of which the last two occur in the conservancy. Thin parchment-like grey bodies found on older bark and on rock surfaces. Growth is slow and the bodies expand by 2-3 mm a year. 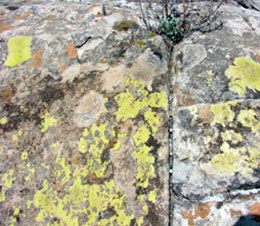 Through chemical action they contribute to the weathering of the rocks, and a recent study in Golden Gate Highlands National Park has estimated that lichens contribute up to 5 tons of sand per year. Crustose lichens often inhabit grave headstones made of sandstone, and because the age of these headstones is known, the rate of weathering can be measured. The lichens in the dark cliff stripes are a special crustose type known as endolithic (under the rock) lichens and occur between the grains just below the surface, with only their fruiting bodies reaching the surface, providing food for bagworms. Vertical dark staining on Clarens sandstone. Parmelia sp on a stone pillar along the Spruit Walk. This sandstone slab, seen on the Kloof walk, has three different species on it.